have become an icon representing Nazareth House Apostolate. Asiatu and Husianatu, twins peering through the window. I couldn't wait to thank the little girls for the beautiful picture. Asiatu & Husianatu holding James' hand. I wanted to personally meet their parents and thank them for myself. I had supplies and rice ready for them. The closer we got to their house, the more excited I became. Finally James drives up to their house and they come out to greet us, except I see only one twin and she is leary of us, staying to herself, distancing herself from all that was going on. James explains to the parents that I am anxious to meet the girls. I notice the change in his face, I don't understand. I am still looking for the other twin. James turns to me and says, "Mum, Asiatu has passed on, she passed four months ago". I knew she had worms, I could tell in the photos. I even brought worm medication specifically for them. Try as I might, I was unable to withhold the tears. My stomach sunk, my heart broke. You want everyone to be okay. Its our nature, especially as Americans,to think we can fix it all. Then there's times like this when reality slaps you in the face and you realize all you can do is keep trying and bear witness to all. People need to know how others live or shall I say barely exist. Husianatu went to the window. How many times I have looked on our website at the girls peering through window. You can see they are peering beyond, looking for a better world. Half of this little team has found it. And Nazareth House will continue to do all it can to help the other twin and her family live a better life while she is still in this world. The twin was standing outside the window and I tried to laugh and joke with her, trying to distract the sadness out of the moment. But that's what the moment held and it was all we had, so we just embraced it. Next thing I knew, Husianatua left and as I looked at the window, I see the lone child peering out. I don't have words to explain the heaviness in my heart as I looked at her, alone in the window. I reached for her, her eyes are so sad, but I remember they are the same sad eyes in the photo on our website. I wander over to Fr. Seraphim, he and James are giving rice to the family. I can't tell you how much it means that you all pooled together to provide the "on-the-ground" needs while we were in Sierra Leone. We were able to do so much with what you gave. This is what its all about: Loving and giving and you've all made that possible. The unity, the teamwork, Nazareth House supporters are the best. Although we now have one less looking at us from out of the window, We also now have one more looking at us from heaven. and Asiatu is cheering us on! Back on the road, we travel on to the next stop... We'll tell you about that later this week. God bless you all, you fill my heart. You fill their hearts. 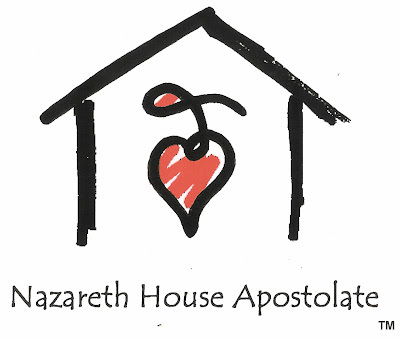 Thank you for your continued support of Nazareth House Apostolate.